We love scuba diving and always try to squeeze in as much of it as we can during our travels. We first got certified during our big trip in Asia, then continued to do as much diving as we could across the continent. Asia is the perfect place to come for scuba diving, with some of the best dive sites in the world. 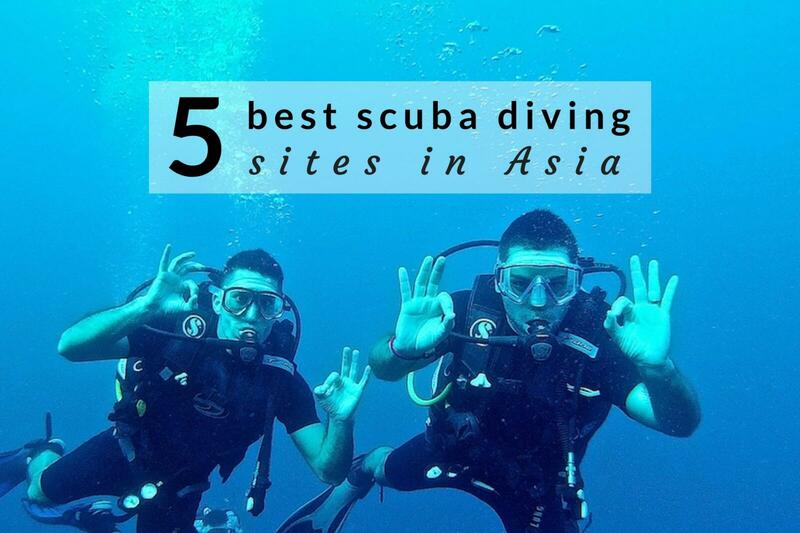 These are our 5 best scuba diving sites in Asia which we completely fell in love and highly recommend you check out. The Maldives is a dream destination. It comprises 26 ring shaped islands formed by coral, which are referred to as “atolls”. The Maldives is located in the middle of the Indian Ocean, close to India and Sri Lanka, so you can easily visit if you're travelling in south Asia. We spent 2 weeks on the gorgeous Thoddoo island, which has many inexpensive guesthouses. Scuba diving was one of the main reasons we wanted to travel here, so we were sure to include it in our itinerary. Scuba diving is usually offered by most hotels in the Maldives and will have a diving school located nearby. The diving here is world class. You can expect to see turtles, manta rays and even sharks. On one dive near Rasdhoo island, we saw white tip reef sharks swimming just 5 metres (16ft) away from us. For more detailed information, check out this article about the best dive sites in the Maldives. The Komodo National Park was established in 1980 and comprises a group of volcanic islands. It was declared a Unesco World Heritage Site in 1986 and has been carefully preserved ever since. It forms part of the Coral Triangle, which contains one of the richest marine biodiversities on the planet. It has 75% of the world’s coral species, 6 of the world’s 7 marine turtle species and over 3,000 marine fish species. The Yaeyama Islands make up the southernmost inhabited archipelago of Japan, some 2,000 kilometres (1,242 miles) south of Tokyo. They form part of the Okinawa Prefecture and are the remotest part of the country. The Yonaguni Monument: a submerged rock formation off the coast of Yonaguni Island, considered Japan’s underwater “Pyramid”. It was discovered in the 1980s, but scientists are still unclear about its exact origins. From the studies carried out, it is believed this monument forms part of the remains of an underwater city called Mu, dating back at least 5,000 years. Manta Rays Scramble: a cleaning station near Kabira Beach on Ishigaki where you’re almost guaranteed to spot Manta Rays, particularly from June to September. Baras Island: the coral around Baras island is one of the best for exploring the underwater world. Baras island itself is a tiny island made of a debris of coral chips. Hammerhead sharks: they can be spotted throughout the year, particularly between December to February. We fell in love with the Philippines for so many reasons: the people, natural wonders like the Underwater River on Palawan island, the many secluded beaches, and of course, the world class diving. We based ourselves on Palawan island near El Nido for our scuba diving trips. The underwater world here is thriving, with lots of tropical life to see. The most popular dive site is the Bacuit Archipelago, which has an array of tropical fish, manta ray, sharks and our favourite, turtles. Like most beginners, we started scuba diving on Koh Lipe in southeast Thailand. Whilst it doesn't have the most impressive coral, it's popular for beginners because the courses are inexpensive. After getting qualified, we headed over to the islands on the southwest coast of Thailand where we found some of the best scuba diving sites in Asia. We based ourselves on the quiet island of Koh Lanta and took day trips to smaller islands like Koh Haa and Koh Rok, which are not as busy as Koh Lipe so you feel more secluded. For us this was one of the most magical scuba diving experiences we've ever had and highly recommend it. I lives in Koh-Tao for 3 weeks when I was in Asia and I LOVE this island. Koh Tao is amazing. Have you tried Borneo already?